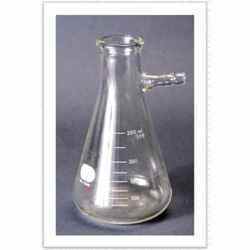 Pioneers in the industry, we offer laboratory glass flask, volumetric flask, filtration flask, iodine flasks, four neck round bottom flasks and conical flask from India. 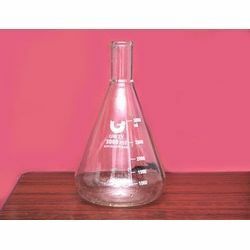 We offer wide range of laboratory glass flask that is made of glass of good quality. The flask that we manufacture are of different shape and sizes according to the need and requirement of our clients. These flasks have various applications such as for experimental purpose in schools, colleges, educational institutions and in laboratory. 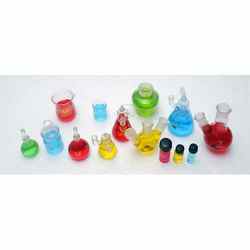 As these flasks are made with glass they are durable in nature and can survive in high temperature. 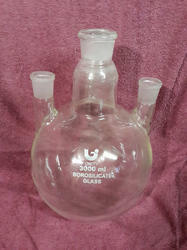 A volumetric Flask is the laboratory equipment that is used to prepare solution. These flasks are made up of glass which have flat bottom with long neck generally a cork is fitted on the top. Our product has accurate volume display which will help to identify the volume of the chemicals. 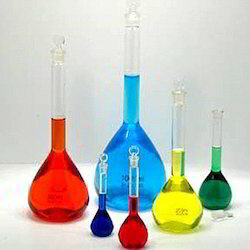 As a manufacturer we manufacture volumetric flask which is made with the use of glass of good quality and thus can resist in high temperature and will not react with different chemicals. As the leading manufacturer and retailer, we are engaged in supplying Filtration Flask, which is used for filtration of liquid or gaseous chemicals. These filtration flasks are made with glass and thus are durable in nature. We have an expert team of technician, designer and medical experts who are engaged in the manufacture of the best quality of product. Our product is assured with its shape, size, design and they are crack free and resist in any temperature. 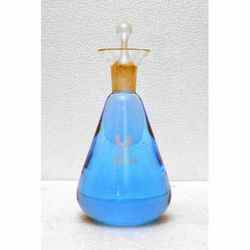 As we are a leading manufacturer of Iodine Flasks, we take special interest in providing our clients with quality product that is chemical and crack resistant. The iodine flasks we propose are good conductors of heat and have appropriate dimensional tolerance. The iodine flasks are used to find out the total iodine content of oils, fatty acids, and bodied oils. We are engaged in manufacturing four-necked flask and three necked flasks, which are made of glass and have two or three neck on the top. These flasks are applicable for different purpose such as for evaporation, or to store chemicals or to transmit heat from one neck. The raw material is of standard quality and thus they are durable in nature and can survive in high temperature and our glass will not react with chemicals. These glasses are available in different sizes according to the need of our clients. As a manufacturer and retailer, we offer a wide range of conical flask that is available in different sizes of 100ml, 200ml, 500ml and 1000ml. We use a high quality of glasses that will increase the life of the flask and also provide resistance in high temperature. These flasks have the measuring units that will help our clients for accurate measurement of chemicals. Our flask are designed in such a manner that it facilitate in proper holding while using. We are engaged in manufacturing two-necked flask and three necked flasks, which are made of glass and have two or three neck on the top. These flasks are applicable for different purpose such as for evaporation, or to store chemicals or to transmit heat from one neck. The raw material is of standard quality and thus they are durable in nature and can survive in high temperature and our glass will not react with chemicals. These glasses are available in different sizes according to the need of our clients.